The first thing we have noticed about this product, was actually about the brand itself. There are practically no negative reviews. Sure, some people have faced some troubles with the product in the past. However, they have all reported amazing customer service. Before we go any further with the actual review, I just want to get something off of my chest. 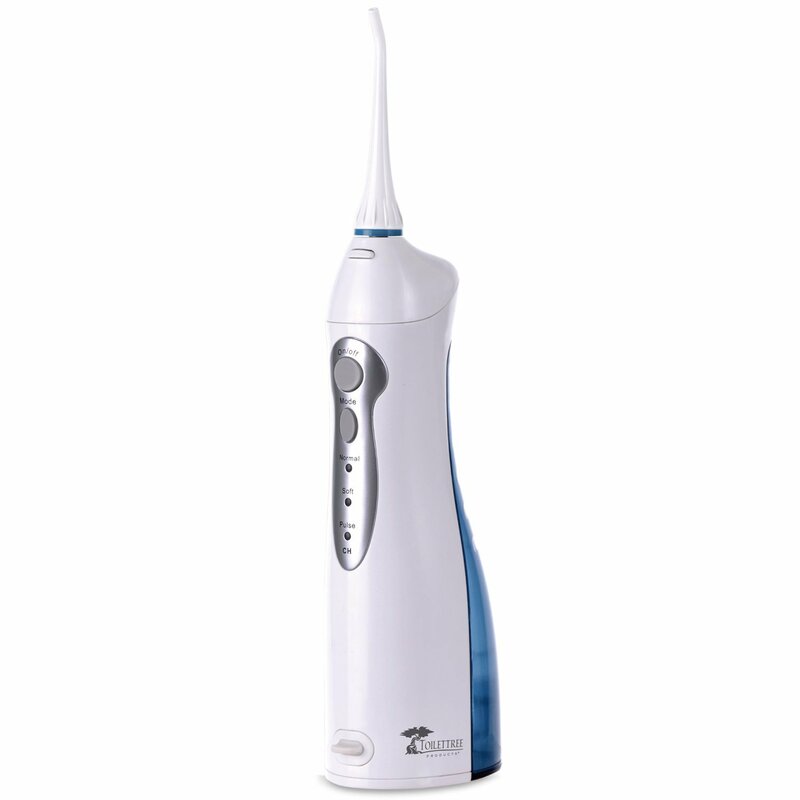 The fact that ToiletTree does not have a model, unit number or anything else to distinguish this oral irrigator from the rest is just killing me. As someone who likes to review products, I like to have a specific name to work with. For example, ToiletTree’s R2D2 flosser, or ToiletTree’s K-2SO model. Besides the lack of an appropriate name for this particular model, the unit is excellent. The dental water jet is well made. The materials used are sturdy, the design is easy to grip and it feels just right when using it. 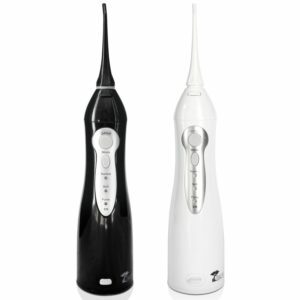 The cordless device is as good as it can get with the current state of water flosser design and engineering. It is small enough for your travel needs. It has a good Lithium ion battery life and it works with universal voltage. 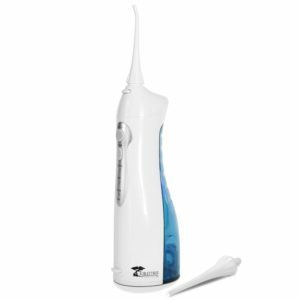 ToiletTree’s oral dental water jet has three flossing modes: normal, soft, and pulse. Our test found the soft feature to be rather too soft. It feels great on the gums and it can easily be used as a massage feature. But, it did not feel strong enough in order to remove some persistent food residue. Normal: 60 psi, runs for about 60 seconds. Soft: 40 psi, runs for about 70 seconds. Pulse: 80 psi, runs for about 75 seconds. We found the above to be accurate info. Normal and pulse modes are great. 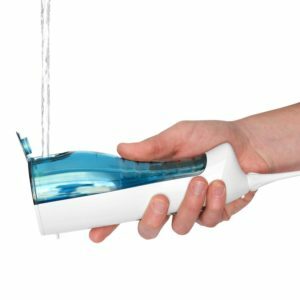 They will do the job, and do it better than other cordless water flossers on the market. Most online reviewers report that the reservoir on this ToiletTree model is the perfect size. It is big enough to comfortably finish a flossing without having to refill it. But, also it is small enough not to make the unit feel bulky. We had different findings. The reservoir felt kind of bulky. Maybe the size of the reviewer’s hands played a role here. Besides feeling a bit big, the water tank only seems to be capable of holding enough water for half a floss. We were not able to complete an entire floss (90 seconds or so) with one filling up of the reservoir which measures around 5 ounces. Because of its bulkiness, the unit feels kind of tricky to maneuver. Especially when the tank is half empty and you need to reach the bottom teeth. Instead of manoeuvring the unit, you might have to learn to maneuver your head and mouth. But, do not let this discourage you. In reality, this is the case with all water flossers. We just had to mention it for the sakes of giving an honest review. Having said all of that, this unit is still better than the Phillips Sonicare Airfloss, that so many people like to compare it to. Once the dental jet is fully charged, it will last about a week. Considering you floss twice a day. Charging is made easy and convenient. You can use any USB port to plug it in and charge it. We have tested this using a laptop, and it worked great. In addition, this unit comes with a dual voltage plug with a female USB output. The long battery life can be quite useful if you find yourself needing a squirt gun. You know, in case you find yourself in a college dorm room hallway, and some cheerleaders start throwing water balloons at you. In this sense, this model outperforms the majority of other cordless models, with the exception of this Panasonic. how or where can i buy a new cord for this. This is a great idea, Ronna. This is not something that we thought about in terms of durability. Thank you for bringing this up, and for the comment. Can this be used in the shower since it’s waterproof?